Trump Hollywood is a 41-story contemporary glass tower under construction with completion expected in 2009. A most-desirable South Florida luxury oceanfront project, Trump Hollywood offers private elevators to 200 expansive, ultra-luxury residences (as Trump and the Related Group are known for). The striking tower will front 240 feet of pristine sandy beach on the Atlantic Ocean, and afford each residence spectacular and unobstructed ocean, Intracoastal, and city of Hollywood views. The floorplans of the residences are large with great spacial flow. The finishings and detailing are the of finest, with Miele kitchens and limestone or marble baths. (Miele personnel will come to your residence after closing to teach you how to use all of their state-of-the-art appliances.) Designed by the award wining and internationally recognized design firm of Yabu Pushelberg, and Robert Swedroe, the celebrated architect renowned for his ground breaking projects. Trump Hollywood will deliver on its promise of privacy and exclusivity for the privileged few who would call it home. Public space amenities are featured on the third floor atop a two-level parking garage and include an elegant two-story lobby opening to an oceanfront pool deck, spa, and cabanas. Residences start on the fifth level affording fine views from even the lowest floor units of 2, 3, and 5 bedroom residences, ranging in size from 2,088 to over 5,000 square feet of air conditioning living space, and every Trump Hollywood luxury oceanfront condo unit will feature expansive terraces range from almost 400 to over 900 square feet. 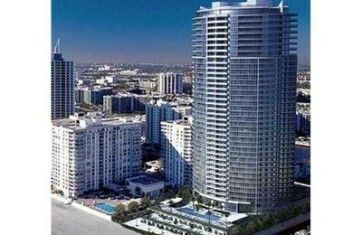 The South Florida high-end luxury market is still healthy and active, and there are incentives available. You can buy in today in the price range of $625 sq. ft. to $779 sq.ft. for a high floor Trump Hollywood Sky Residence. One of the two-story 8,926 sq. ft. luxury oceanfront penthouses on the 41st floor is being offered at over $7 million–A unique opportunity to own a truly spectacular home in the sky. Trump Hollywood Beach is minutes away from all that Miami and Ft. Lauderdale have to offer, with some of the area’s premier destinations within minutes. From world-class dining and shopping at Bal Harbour Shops and Las Olas Boulevard, to museums, theaters, Fort Lauderdale/Hollywood International Airport, and Port Everglades, the idyllic beachfront site also offers proximity to exciting city life. The vibrant Hollywood Boardwalk, Diplomat Landing and the Westin Diplomat Resort & Spa are within walking distance.